Tired of watered down drinks? Can't get from home to work without your coffee getting cold? The ORCA Chaser can fix that. In today's world everyone is on the move, and ORCA has built the tumbler to help. 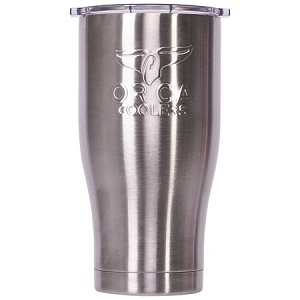 Whether you are going to work, the ball field, a tailgate, into the woods, down to the dock, or to a party, our stainless steel cup will get you there with an ice-cold or piping hot beverage. The ORCA Chaser's double walled vacuum sealed body ensures that your ice will stay frozen and your drink will stay strong. Its team color lid makes it easy to see when it's time for a refill.